The dress clip has finally made a comeback — and with the resurgence comes some unique ways to wear this novelty accessory of yesteryear. Victory rolls and painted-on stocking seams have yet to be in fashion again, but the bygone dress clip is making a comeback. The novelty vintage collectible is seeing a revival in popularity and manufacturing thanks to picture-perfect period dramas. Dress clips were especially popular during the Depression, the domain of supper clubs and glamour, popularized in escapist 1930s films featuring Talullah Bankhead or Canadian-born stars like Norma Shearer and Fay Wray. The clear rhinestone styles peaked in popularity in the 1930s, and modern day celebrity Charlize Theron memorably channeled that old Hollywood glamour when she clipped a vintage pair of diamond Fred Leighton dress clips onto the straps of her Vera Wang halter dress at the 2000 Oscars. During World War II when fashion was on the ration, dress clips quickly perked up a woman’s day dress or adorn collars and décolletage, and the styles tended to more colourful faux gemstones and glass pearls, along with textured Bakelite and other early plastics carved into leaf and abstract motifs. I found a kindred spirit last year when I met fashion history lecturer Eve Townsend. Townsend did her MA in Fashion and her research focuses on the history of costume jewellery and its role in the democratization of fashion. We commiserated about how many of the great American-made manufacturers are still unexplored — and that there has yet to be a thorough exploration of the dress clip phenomenon itself. But this year, Townsend has done her bit in adding to research and awareness: she’s just co-authored Schreiner: Masters of Twentieth Century Costume Jewellery with Carole Tanenbaum, Canada’s pre-eminent costume collecting maven. It’s a must-read for aficionados. The way they wore them in our mother’s and grandmothers’ day is how you see them in accurate period costume dramas like Downton Abbey, The Crown, Marvelous Mrs. Maisel and Allied: clipped as symmetrical pairs on either side of a sweetheart neckline or on the straps of an evening dress. 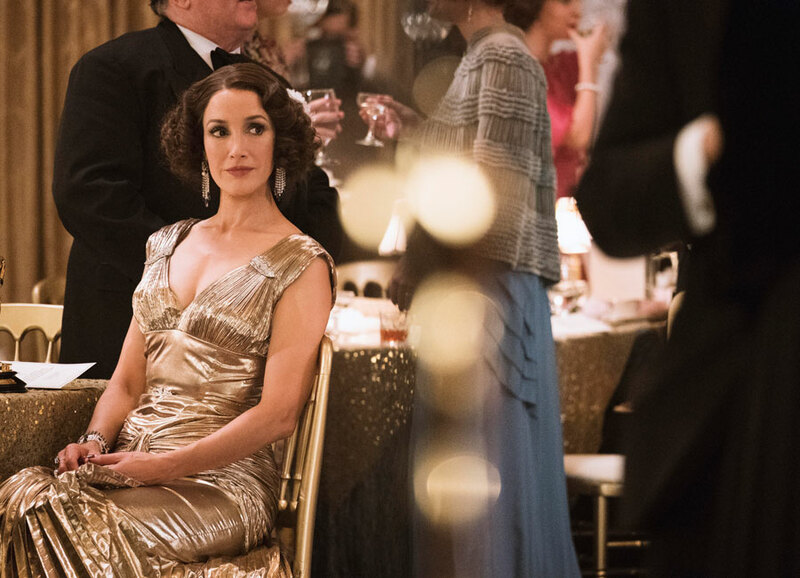 Many such examples can be spotted on Jennifer Beals and Rosemary DeWitt’s glamorous Hollywood dames in the adaptation of F. Scott Fitzgerald’s The Last Tycoon (streaming via Amazon Studios), where series costume designer Janie Bryant of Mad Men fame paired them with silk chiffon and gold lamé gowns. One of favourite vintage ways of styling them comes from a photo of Barbra Streisand in her 1970s headwrap phase — in one iconic image, she wears an elongated 1930s clip affixed to her turbans. Not everyone can pull off a turban with such élan, so the idea can also be adapted to the brim of a felt hat or clipped to the cuff of a toque. Jennifer Beals sports a pair of dress clips in the television series adaptation of F. Scott Fitzgerald’s The Last Tycoon. Today, a new generation is adapting them to everyday use. The stylish American socialite Olivia Palermo, for example, is an avid collector who has been wearing dress clips casually for years — I’ve seen her clip pairs to the notch of her jacket lapels or sweater paired with jeans as well as wear them on little black cocktail and dramatic red carpet looks. Others tag them onto shirt collars. I tend to scatter a few down one blazer lapel myself, but have also worn them on a wide velvet ribbon as an impromptu choker, or around a chain as a bold and unexpected pendant. I’ve even spotted them on men, clipped onto a jacket lapel or pocket in lieu of a silk pocket square. If you don’t happen to have a few lying around from your mother or grandmother, the dress clip has until very recently been an obsolete format, in precious form sometimes coming up at fine jewellery auctions or in costume jewellery style easily found secondhand on Etsy and eBay, at flea markets and in thrift antique shops. When you’re browsing through vintage display cases, they’ll be the smallish, brooch-sized pieces of jewellery that are often easily mistaken for clip-on earrings or shoe clips. They rarely survive in pairs. A dress clip will have a triangular or elongated springback that’s studded with sharp little spikes (to secure the jewellery to the underside of fabric). Similarly, the fur clip (the dress clip’s kissing cousin) has two sharp, swivelling needle-like prongs designed to pierce the pelt of a fur lapel or collar. In good but not perfect condition all but the rarest of costume jewellery manufacturer dress clips costs $20-$30. Sarah Jessica Parker accents her gown with a single dress clip. Perfect, like-new condition dress clips with all rhinestones intact and showing no signs of darkening or yellowed setting are scarce. As an avid collector myself, I’ve often lamented that there haven’t been any new costume jewellery dress clips manufactured since the mid-1950s. Until now. Chelsea Armstrong, a young Canadian entrepreneur from Vancouver who studied at Parsons School of Design and has worked at Aritzia and Kate Spade, recently launched a new dress-clip brand called Jubilee Jones. Since it’s aimed primarily at the special occasion market, this season Jubilee Jones is focused on reviving the art deco and glittery streamline geometric styles of the 1930s that mix baguette and round-cut rhinestone. But the brand also wants clients to get wear out of them and their instagram feeds regularly comes up with inventive ways to wear dress clips beyond cocktail and bridal attire — on a sweater collar or a waist sash, for example. In another twist that’s similar to the Coro Duette patent system, (where you could mount a pair onto a pin-back to wear as a larger brooch), Jubilee Jones offers single clips but also sells custom mounts that convert the clips into hair barrettes and even earrings — again, more opportunities to wear them. And like the classic costume jewellery that has endured, they’re all Made in the U.S.A.